Empire of the Third Dynasty of Ur (in green). West is at top, North at right. Utu-hengal, Prince of the Summerian city of Uruk, praying for victory against the Gutian king Tirigan. 19th century illustration. It is possible that Ur-Nammu was originally his governor. There are two stelae discovered in Ur that include this detail in an inscription about Ur-Nammu's life. Many significant changes occurred in the empire under Shulgi's reign. He took steps to centralize and standardize the procedures of the empire. He is credited with standardizing administrative processes, archival documentation, the tax system, and the national calendar. He captured the city of Susa and the surrounding region, toppling Elamite king Kutik-Inshushinak, while the rest of Elam fell under control of Shimashki dynasty. The rulers of Ur III were often in conflict with the highland tribes of the Zagros mountain area who dwelled in the northeastern portion of Mesopotamian area. The most important of these tribes were the Simurrum and the Lullubi tribal kingdoms. They were also often in conflict with Elam. Enthroned King Ur-Nammu, founder of the Third Dynasty of Ur ca. 2047 BC, on a cylinder seal. His name appears vertically in the upper right corner (𒌨𒀭𒇉). Abraham, the common patriarch of the three Abrahamic religions, was probably born in Ur around that time, although estimated dates range from 2300 BCE until 1960 BCE, date of the destruction of Ur, and the identification of Ur with the Ur of the Chaldees in the Hebrew Bible is not entirely certain. The power of the Neo-Sumerians was waning. Ibbi-Sin in the 21st century launched military campaigns into Elam, but did not manage to penetrate far into the country. 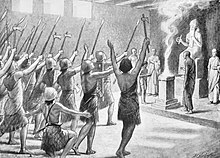 In 2004/1940 BC (middle/short chronology respectively), the Elamites, allied with the people of Susa and led by Kindattu, king of the Elamite Shimashki dynasty, managed to sack Ur and lead Ibbi-Sin into captivity, ending the third dynasty of Ur. After this victory, the Elamites destroyed the kingdom, and ruled through military occupation for the next 21 years. Mesopotamia then fell under Amorite influence. The Amorite kings of the Dynasty of Isin formed successor states to Ur III. They managed to drive the Elamites out of Ur, rebuilt the city, and returned the statue of Nanna that the Elamites had plundered. The Amorites were nomadic tribes from the northern Levant who were Northwest Semitic speakers, unlike the native Akkadians of southern Mesopotamia and Assyria, who spoke East Semitic. By around the 19th century BC, much of southern Mesopotamia was occupied by the Amorites. The Amorites at first did not practice agriculture like more advanced Mesopotamians, preferring a semi-nomadic lifestyle, herding sheep. 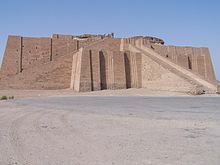 Over time, Amorite grain merchants rose to prominence and established their own independent dynasties in several south Mesopotamian city-states, most notably Isin, Larsa, Eshnunna, Lagash, and later, founding Babylon as a state. 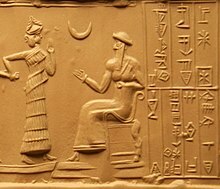 Cylinder seal of King Shulgi, Louvre Museum. An architectural foundation-nail figurine depicting king Amar-Sin himself carrying the builder's wicker traybasket. His name translates to 'immortal moon-god'. Slaves also made up a crucial group of labor for the state. One scholar[who?] estimates that 2/5 of chattel slaves mentioned in documents were not born slaves but became slaves due to accumulating debt, being sold by family members, or other reasons. However, one surprising feature of this period is that slaves seem to have been able to accumulate some assets and even property during their lifetimes such that they could buy their freedom. Extant documents give details about specific deals for slaves' freedoms negotiated with slaveowners. One salient feature of Ur III is its establishment of one of the earliest known law-codes, the Code of Ur-Nammu. It is quite similar to the famous Code of Hammurabi, resembling its prologue and bodily structure. Extant copies, written in Old Babylonian, exist from Nippur, Sippar, and also Ur itself. Although the prologue credits Ur-Nammu, the author is still somewhat under dispute; some scholars attribute it to his son, Shulgi. Most legal disputes were dealt with locally by government officials called mayors, although their decision could be appealed and eventually overturned by the provincial governor. Sometimes legal disputes were publicly aired with witnesses present at a place like the town square or in front of the temple. However, the image of the king as the supreme judge of the land took hold, and this image appears in many literary works and poems. Citizens sometimes wrote letters of prayer to the king, either present or past. Cylinder seal of King Ur-Nammu. Evidence for imports from the Indus to Ur can be found from around 2350 BCE. Various objects made with shell species that are characteristic of the Indus coast, particularly Trubinella Pyrum and Fasciolaria Trapezium, have been found in the archaeological sites of Mesopotamia dating from around 2500-2000 BCE. Several Indus seals with Harappan script have also been found in Mesopotamia, particularly in Ur and Babylon. About twenty seals have been found from the Akkadian and Ur III sites, that have connections with Harappa and often use the Indus script. These exchanges came to a halt with the extinction of the Indus valley civilization after around 1900 BCE. 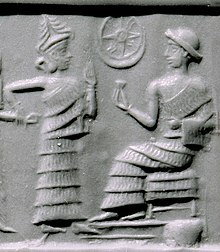 The last king of the Ur III dynasty King Ibbi-Sin (c.2028–2004 BCE) enthroned, with standing goddess. Sumerian dominated the cultural sphere and was the language of legal, administrative, and economic documents, while signs of the spread of Akkadian could be seen elsewhere. New towns that arose in this period were virtually all given Akkadian names. Culture also thrived through many different types of art forms. Cuneiform tablet impressed with cylinder seal. Receipt of goats,ca. 2040 B.C., year 7 of Amar-Sin. Neo-Summerian. Cuneiform tablet impressed with cylinder seal. Receipt of goats,ca. 2040 B.C. Neo-Summerian (drawing). Administrative Tablet, Third Dynasty of Ur, 2026 BC. ^ Eidem, Jesper (2001). The Shemshāra Archives 1: The Letters. Kgl. Danske Videnskabernes Selskab. p. 24. ISBN 9788778762450. ^ Frayne, Douglas (1990). Old Babylonian Period (2003-1595 BCE). University of Toronto Press. pp. 707 ff. ISBN 9780802058737. ^ Nagell, Edward (2006). Destiny: Volume Two: God, Creation, and Religion, God's Actions and Mankind's Reactions. Infinity Publishing. ISBN 9780741433701. ^ Bryce, Trevor (2009). The Routledge Handbook of the Peoples and Places of Ancient Western Asia: The Near East from the Early Bronze Age to the fall of the Persian Empire. Routledge. p. 221. ISBN 9781134159079. ^ D. T. Potts (12 November 2015). The Archaeology of Elam: Formation and Transformation of an Ancient Iranian State. Cambridge University Press. p. 133. ISBN 978-1-107-09469-7. ^ John Bagnell Bury; et al. (1925). The Cambridge Ancient History. Cambridge University Press. p. 607. ISBN 0-521-07791-5. ^ Stiebing, William H. (2016). Ancient Near Eastern History and Culture. Routledge. p. 85. ISBN 9781315511160. ^ "Seated figure approached by a goddess leading a worshiper". www.metmuseum.org. ^ a b Spar, Ira (1988). Cuneiform Texts in The Metropolitan Museum of Art Volume I Tablets Cones and Bricks of the Third Ur Dynasty (PDF). The Metropolitan Museum of Art. p. 38, Nb 35.